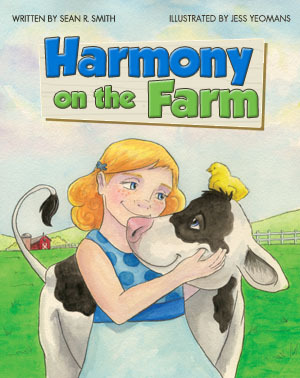 For those parents who want a good message regarding our relationship with animals, Harmony on the Farm makes a solid choice. The book follows Harmony, a young girl, who visits her grandparents’ farm. Only the farm is really more of a sanctuary, because her grandparents are vegetarian and the animals will live out their lives peacefully on the farm. After befriending each of the animals, it’s time for Harmony to visit the grocery store with her mother. There, she asks questions about what hamburger and bacon are. The story provided a refreshingly honest look at the subject, as her mother gives her straight answers about where such products originate. When Harmony learns the truth about meat, she decides to become a vegetarian, and her parents are supportive and embrace it, as well. Ages 3 to 7. A review copy was provided by the author. Thanks for the review! It sounds wonderful. I just add this book to my wish list. Sounds like a great book! It’s really nice to hear stories about children who are working through things *and* supportive adults! I work at a public library. Thanks to your wonderful reviews, I can get ideas about books I’d like to purchase for our collection…like this one! We have several vegetarian families who visit our library, too. Peace, that’s amazing! So happy to hear that you find the reviews helpful, and it’s nice to know there are librarians who seek out veg-friendly books.